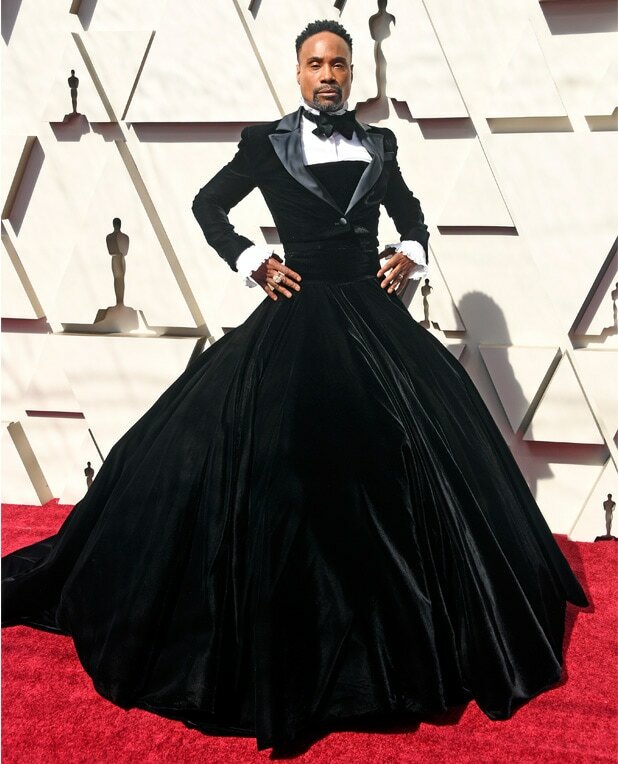 Billy Porter The "Pose" star donned a velvet tuxedo gown by Christian Siriano, and is one of the most-talked-about looks of the evening so far. Will he be topped? 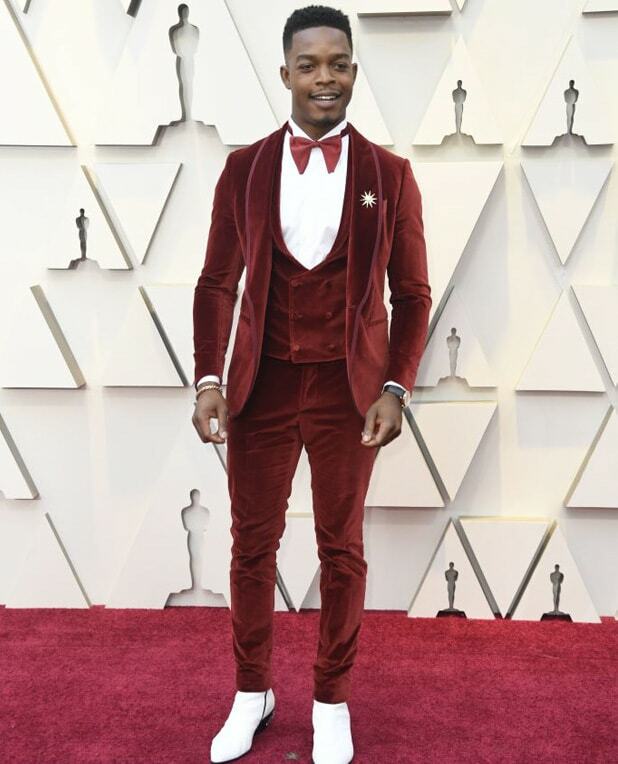 Stephan James The "If Beale Street Could Talk" star wore a red velvet tuxedo with a red bow tie and a brooch. Eye-catching! 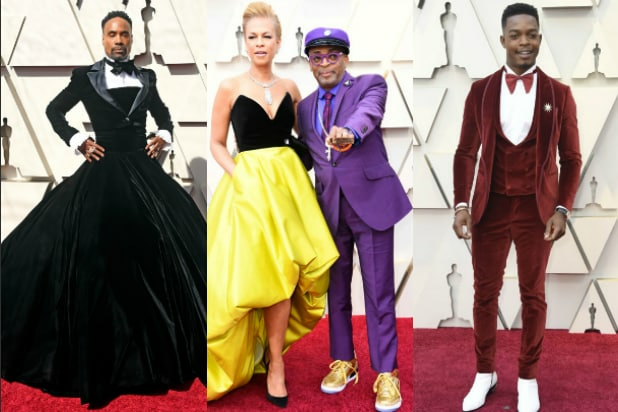 Spike Lee The director, who is nominated for directing, producing and co-writing the drama "BlacKkKlansman," threw it back to "Do the Right Thing," and donned a purple ensemble with rings saying "LOVE" and "HATE." Adam Lambert Lambert will be performing alongside Queen during the show, but he had fans talking way ahead of showtime in his tuxedo paired with exaggerated large french cuffs (sans cuff links), no tie or bow tie, and an orchid brooch. His earrings made quite the statement as well. Questlove The musician took on a more casual look this evening and opted for some color pops of red with a patterned shirt and a red necklace under his black suit. Richard E. Grant A supporting actor nominee for "Can You Ever Forgive Me," Richard E. Grant sported a dark red jacket with grey lapels, grey vest and a black bow tie. Juicy J Talk about a statement jacket! Juicy J donned a zebra-print jacket with black lapels on the red carpet. Henry Golding "Crazy Rich Asians" star Henry Golding sported a white vest and accessorized with a pocket watch chain. Looking sharp! Chadwick Boseman "Black Panther" headliner sported an elegant ensemble straight out of Wakanda. Jason Momoa "Aquaman" star Jason Momoa arrived with Lisa Bonet and looking like Atlantean royalty in a suit that Karl Lagerfeld personally designed for him before his death last week. Tommy Hilfiger The designer's ensemble was probably one of the loudest of the night, with different colors and flannel prints all over the place... paired with marijuana loafers.